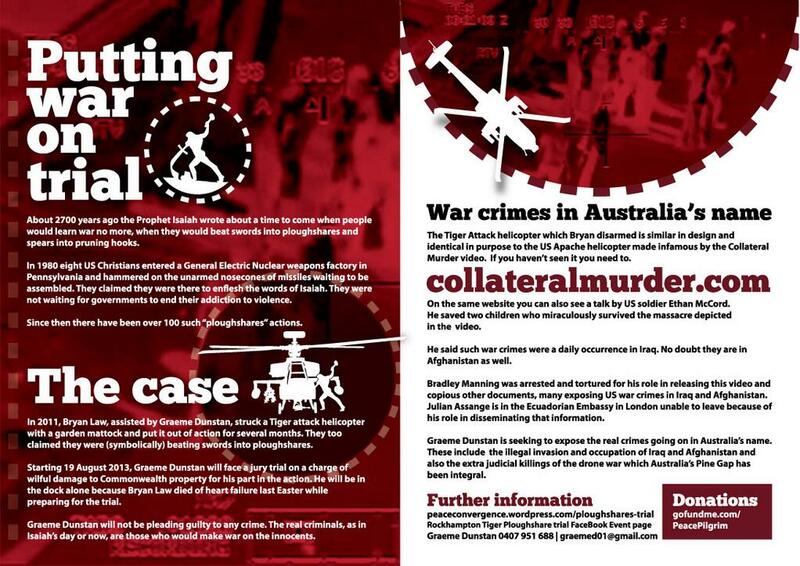 Collateral Murder is screened in Australian Ploughshares Trial. Hung Jury eventually convicts. Well past midnight our time, Graeme and his supporters are preparing to go back to court for the fourth day of the trial, when the jurors will be asked to try again to reach an agreed verdict. One supporter outside the court holds up a placard: “Bradley Manning got 35 years for telling the truth”. Indeed. Within a short time, the jury returns to declare that a verdict has been reached. Graeme is pronounced guilty. It’s hard to stand firm when you’re in a small minority. People like to belong and compliance is often secured without true agreement being achieved. What’s certain is that those two jurors yesterday believed that Graeme had committed no crime. They were right. This isn’t justice any more than 35 years for Bradley Manning is justice. I still haven’t watched any of the sentencing news from Bradley’s trial but Ciaron told me earlier that David Coombs was in tears after the sentence was handed down and that Bradley had comforted and reassured him. Graeme’s supporter Rev. Simon Moyle reports that one of the juror’s eyes were filled with tears as she left the courtroom. The Judge says he will sentence after lunch, but doesn’t think a custodial sentence is necessary. Later Graeme is given a two year suspended jail sentence and a very substantial fine for his part in grounding a $45m aerial killing machine for 4 months. The Judge notes his commitment to peace. Latest: Jury divided. Asking how to proceed. Jury is given more time to try to reach a decision. Judge later sends Jury home to return tomorrow (Thursday) by which time we’ll have the Bradley Manning sentence and Collateral Murder will have hit the mainstream media headlines again. Jury currently divided 10 guilty: 2 not guilty. Inside, the Jury is out while outside the court, Graeme and his supporters remember others of their brothers and sisters who are in jeopardy for the sake of peace and justice: Edward Snowden, Sarah Harrison, Julian Assange, Saeed Chmagh, David Miranda, Namir Noor-Eldeen, Glenn Greenwald, and Bradley Manning whose sentence will be handed down later today. See also this video footage. As Bradley Manning’s trial finally draws to a close and he awaits sentencing at NSA HQ, Fort Meade in the US, the Collateral Murder video he released of a helicopter gunship attack – an attack that killed twelve civilians including two Reuters journalists and critically wounded two children – was admitted as evidence in Graeme Dunstan’s trial in Rockhampton, Australia. Graeme Dunstan and the late Bryan Law acted to prevent another Collateral Murder by putting an Australian helicopter gunship out of action with a garden mattock in a Ploughshares action in 2011 during the Talisman Sabre joint US/Australian military training exercises that take place every two years. On Monday, the first day of the trial, Graeme asked if the Collateral Murder video could be played to the court. The Judge replied that it would be going too far to introduce comparisons and show movies to the DMO witness, who was claiming that he had never seen the footage. On Tuesday, however, following moving testimony from Graeme on the witness stand under examination by supporter Sean O’Reilly during which Graeme described the harrowing contents of the Collateral Murder footage, there were further arguments about the admissibility of this footage as evidence. The Judge, who admitted that he had already seen the video, then ruled that it was admissible and the full video was played to the court as part of Graeme’s defence of necessity (Judge has ruled out a moral defence). Graeme then took the stand again to explain where Bradley Manning and Julian Assange come into the story. As the defence case continued, Rev. Simon Moyle explained how the Biblical prophecy of Beating Swords into Ploughshares influenced Graeme’s and Bryan’s action and Donna Mulhearn gave powerful eyewitness testimony of her experiences of helicopter gunships operating in Iraq. The prosecution didn’t cross-examine Donna, leaving her evidence unchallenged. The trial continues Wednesday when the Prosecution and Defence will conclude their cases, the Judge will sum up and the Jury will begin its deliberations. Follow #StandbyGraemeD hashtag on Twitter for more on this important trial. 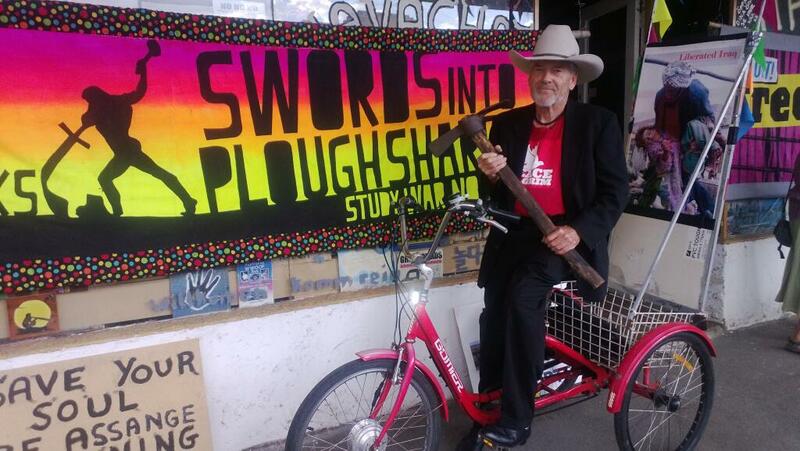 Above: Graeme with the garden mattock and tricycle used in the Rocky Tiger Ploughshares Disarmament Action. 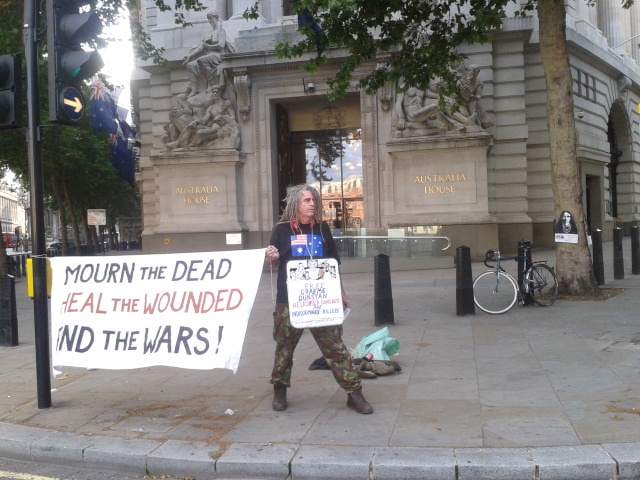 There was a solidarity vigil for Graeme Dunstan outside the Australian High Commission in London yesterday by Ciaron O’Reilly, a Ploughshares activist who has been a prisoner of both the United States and Australia and who has been working in solidarity with Bradley Manning and Julian Assange these past three years. Read about the vigil, see the solidarity video and photos in this post. 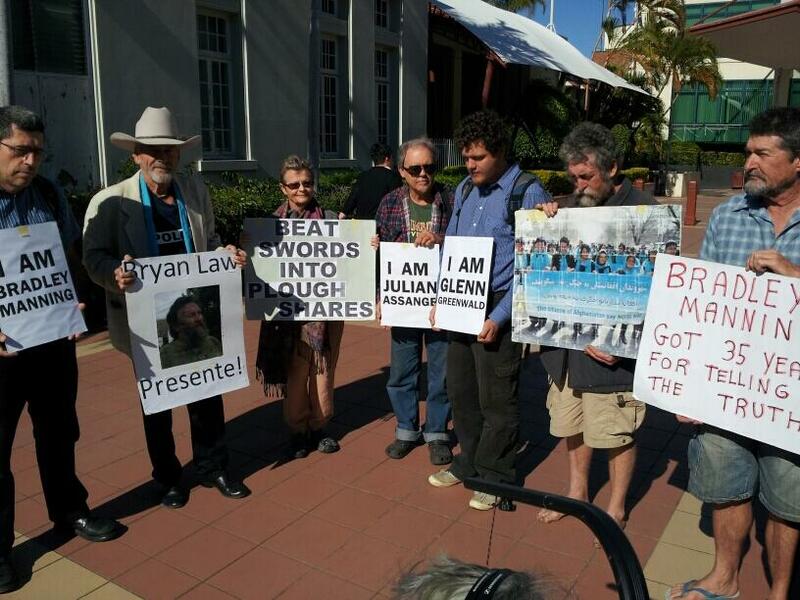 Gallery | This entry was posted in Assange, Manning, Reports and tagged Australia, Collateral Murder, Graeme Dunstan, London, Ploughshares, Rockhampton, solidarity, trial. Bookmark the permalink. 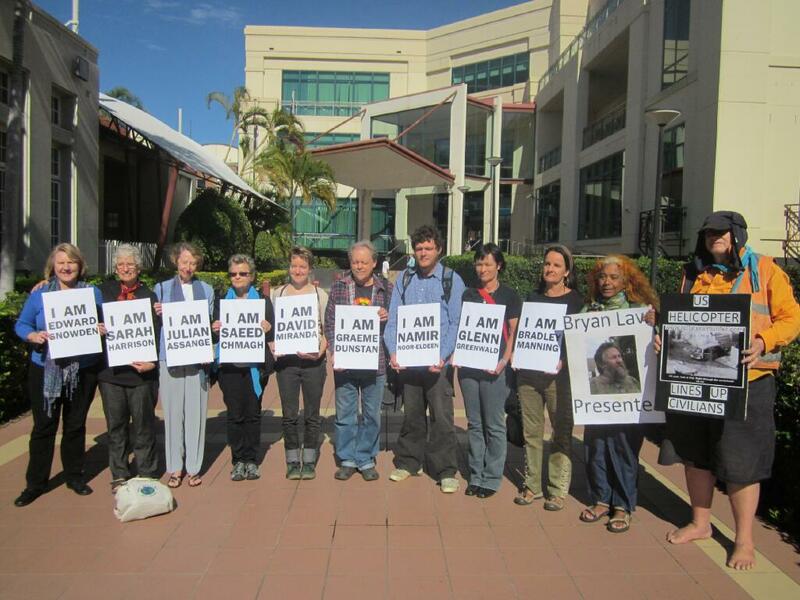 3 Responses to Collateral Murder is screened in Australian Ploughshares Trial. Hung Jury eventually convicts. Whst a show trial! Let us hope Howards liberal war is explaibwd to many as a dirty unnecessary global game for a few to be filthyrich. Thanks for giving up so much for a better world..